A free gift accompanies each of the first 500 books sold! SHIPPED TO CANADA and signed for whom (if desired)? SHIPPED TO USA/INTERNATIONAL and signed for whom (if desired)? Watch the trailer for King's Highways & Steam Trains (volume 1)! 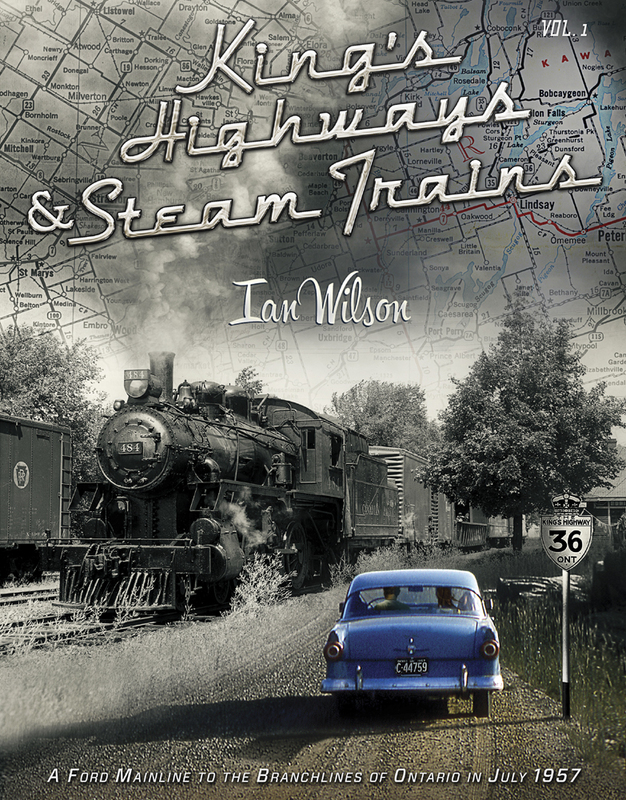 Imagine... travelling back to 1957 as a young man in search of steam locomotives on the branchlines of Ontario... in a classic car! Twenty one-year-old Angus Wolfe wanted to explore the railway steam era. But the only place to discover that world was in books. The trains, the tracks, all vestiges of the 1950s had disappeared. Then Old Eddie, a retired mechanic, let Angus in on a secret. Eddie’s lovingly-restored 1956 Ford Mainline, which had sat abandoned for half a century, was a time-travel vehicle. It could take Angus back to any day marked on a 1957 calendar. Just picture yourself in Angus’s shoes. Driving the King’s Highways of Ontario behind the wheel of a classic car—in 1957—searching for steam locomotives. Imagine losing yourself in that tale! Blue skies, open spaces, steam trains and classic cars everywhere, lovely companion Amanda by your side. And being 21 years old! King’s Highways & Steam Trains is your ultimate ticket to adventure. What are you waiting for? Flip the book open, turn to the beginning of the story, and escape to July 1957. Limited-edition Volume One of King’s Highways & Steam Trains only sets the stage—there is a whole series of 1950s adventures to come! Watch this website and/or blog... or better still, sign up for one of our email lists (see signup box on any page) and receive news of new volumes in advance! Please click the applicable button once for each copy of the book you would like to order (you can also modify quantities in your shopping cart). To order by cheque/check or money order, please download and print our current flyer. Remember—A free gift accompanies each of the first 500 books sold! Shipped to USA/INT'L and signed for whom (if desired)?